AVM Garden Villa is a vintage property that aims to be a tailored fit for all kinds of events. Built by movie mogul and founder of AVM Studios, Mr. A.V. Meiyappan in 1965, this near two-acre property is on Arcot Road, Vadapalani. 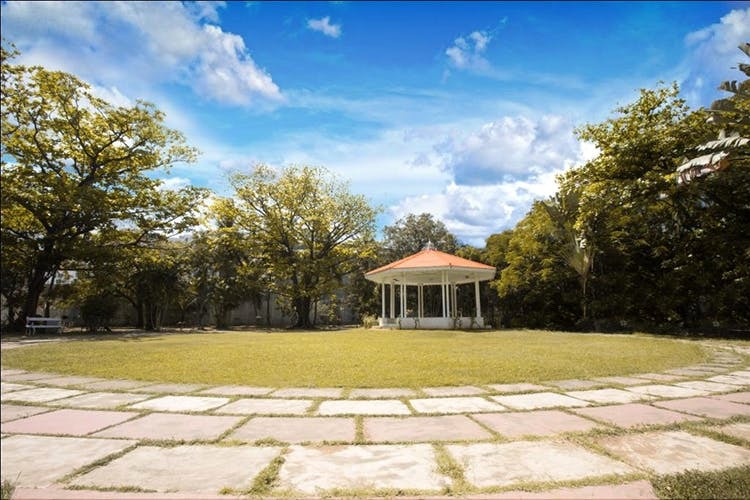 Once featured in movies such as Padiyappa and Annamalai, the property has now been repurposed as a venue to host events of all kinds, but more on that later. This glitzy manor in the middle of the city has played host to some of the biggest names in Tamil cinema, like MGR and Rajnikanth. The main building is surrounded by large lawns with walkways and gazebos, and a lineup of flora that makes it feel quite royal. Moving inside, the marble floors, high ceilings, and vintage furniture echo that sentiment. There is a functional kitchen, dining hall and two bedrooms that can be refitted based on your specific needs. Outside of that, there are large halls on two floors that would be great for art exhibitions and such thanks to the natural light that comes in through the large glass windows. Most importantly, the building is centrally air-conditioned and can handle large numbers of people. AVM Garden Villa comes with a team behind it that aims to customise the venue based on your requirements. Not only that, they’re capable of working with large scale events as well, like weddings and sangeeths, so it’s not just photo shoots and parties. The results can be seen in their photographs, everything from fairy lights to furniture can be arranged for. As far as spaces to rent go, this one is cut above the rest, sheerly in terms of aesthetic. The property’s colonial style makes it feel grand and we think it’s a great space, especially for outdoor events.